Keeping kids reading, writing and learning over the summer is crucial. I recently shared that the Lil Divas were keeping a summer writing journal and enjoying fun writing prompts. Journaling is such a great way to get kids writing. Today, Jen from Kitchen Counter Chronicles is sharing a writing idea that I truly love - a Summer Gratitude Journal! I am excited to be visiting from my blog, Kitchen Counter Chronicles , and sharing this activity with you today. I have two daughters, who are 7 and 9 years old. They are happy, creative and smart girls, but are they grateful for all that they have? Gratitude. How can I teach my girls gratitude? I try and remind my girls how fortunate we are, to live where we live and have all that we have. The reality is that they are so young and their experiences are so limited, they really cannot understand what the word mean. This summer I decided that I wanted to find a more concrete way to help them understand what it means to be grateful. 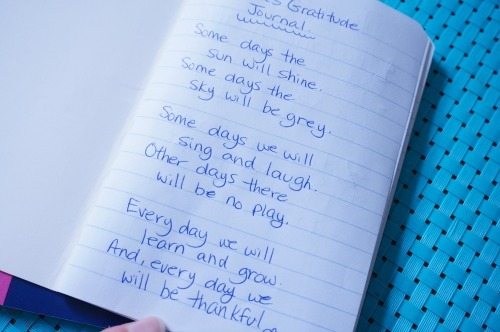 The idea of a gratitude journal seemed like the perfect tool to use. I hoped that writing in the journal, every day, would help them see all the beauty in life around them. First, I picked up a small journal, with lined pages for each of my daughters. It was important to pick a journal with lined pages, so that writing clearly would be easy. I also provided each of my girls with a pencil to write with. Next, I wrote a brief poem on the front page about gratitude. I thought this poem would help to inspire them and help them understand that sometimes we might be thankful for the challenges we face, not just the "happy" things that happen. Finally, I spoke to each of my girls individually about her journal. I explained that they could write about whatever they like. It is up to them if they write about one thing or more. I only asked that they think about the day and write about what they are thankful for. Whatever that means...at the end of every single day. Each of my daughters had a different reaction. My youngest was excited and explained that she would be writing about 2 things each day. She wanted to put the date on each page. She wanted to number each thing she is grateful for. Her mind is very methodical and logical. I wasn’t surprised by her chosen method. My eldest daughter, on the other hand, decided to write a paragraph each day. She has a real passion for creative writing and that is exactly how her journal is structured. Each day is a new short story of gratitude. This exercise has been wonderful. My daughters have only been writing in their journals for a couple of weeks and I can see them being more thoughtful every single day. At bedtime they check in with each other to make certain they write an entry in their journals. I am so grateful for these gratitude journals. I can’t wait for the end of the summer, when we can all sit down and read them together and reflect on all the amazing things my girls are truly grateful for. 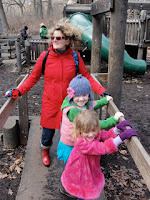 In my "previous life" I was a mental health professional...in my current life I'm a stay-at-home mom with 2 beautifully adventurous kids. I share everything that lands on our kitchen counter over on my blog, Kitchen Counter Chronicles. Swing by and learn how we are greening our lives; what we are crafting; what we are cooking and what we are reading. While you will often find the girls and I inside the kitchen, you will also find us out getting our hands dirty, exploring and learning outdoors. I can also be found on Facebook and Pinterest. I love this idea. Hopefully it will continue after the summer as well! 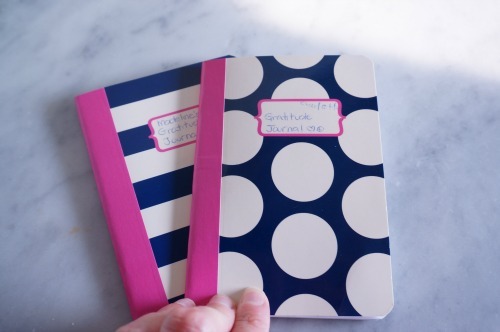 I love all things stationery and letter writing over at www.ritewhileucan.com so I especially loved your journal idea here. Not only does it foster a grateful heart but gets kids writing too!